This is the original English summary from the Program - mispelled names and gender confusion were left intact. The story takes place in France in 1788 a period in which the dynasty of the Bourbons was in decline. In Paris at the Opera House a grand ball was being held in honor of Marie Antoinette the last Bourbon queen Also at the ball was a young Swedish prince who chose to flaunt his disregard for the gossip that had made it common knowledge in the Court and on the city streets that the Queen and Prince Fersen were lovers. The prince truly loved the Queen and so Oscar the Commander of the Royal Bodyguard found her heart full of sorrow because of her love for the Prince. At the ball Oscar had not come in her usual crisp military uniform but had worn a stunning ball gown. She danced with Fersen but the Prince's eyes were only for Marie Antoinette. Andre who had been raised with Oscar as if they were brother and sister consoled the forborne Oscar. Andre had fallen in love with Oscar. The political tension in Paris steadily increased as citizens who hated the aristocracy united. Among the anti-royalists were two poor sisters, Jeanne and Rosalie. Jeanne hated the poverty of her life and sought the help of a certain Lady Polignak who was close to the Queen. Meanwhile Rosalie found herself alone after her adopted mother was killed under the wheels of an aristocrat's coach. As she lay dying, her adopted mother confessed that Rosalie was the child of an aristocrat. Heartbroken Rosalie was determined to avenge the death. She broke into Oscar's palatial home believing it to be the Versailles Palace. She was apprehended by Oscar who recognized Rosalie as the child raised in her own house for a mother of noble lineage who wished the child's existence to remain secret. The tragic irony was that Lady Polignak had run over Rosalie's adopted mother and that Rosalie's real mother was none other than Lady Polignak. Since that summer a mysterious man known as the Black Knight had been attacking the nobles of the land. When he broke into the Palace of Versailles he was captured by Oscar and Andre. He pleaded with his captors to sympathize with his cause. He argued that the ruling class had to be made aware of the misery of the ordinary people's lives and of the crushing burden of the heavy taxes. Oscar was greatly moved by the Black Knight's compassion for the people of France. Oscar decided that henceforth the Royal Bodyguard would protect the rights of the common people. Lady Polignak had been plotting to extend her influence at court and when Oscar thwarted her plans she challenged him to a duel over a contrived slight. With her most skilful cousin representing her a duel seemed to be the easiest way to get rid of the troublesome Oscar. Andre realized what Lady Polignak was up to and fought in Oscar's place. The duel cost Andre one eye. Just then riots broke out all around the country and rioters were marching on Versailles itself. Marie Antoinette was determined to do whatever necessary to protect the Bourbon dynasty and in no case to give in to the revolutionaries. The situation in Paris became chaotic and control was rapidly slipping out of the government's grasp. General Jarjet now deeply regretted his decision to raise his daughter Oscar as a boy and later to install her as commander of the Royal Bodyguard He intended to make his daughter happy as a lady by arranging a marriage with major Jerodel. Andre learned of the marriage plan. He had been secretly in love with Oscar for over ten years. In despair, he decided to put poison into Oscar's wine and then to take his own life as well. But at the last moment he couldn't bear to think of his loved one suffering and he could not go through with it. However, later on the evening before they were due to go into action against the armed rebels, Oscar learned of Andre's love for her and realized that she had found true love. Beside the river Seine Oscar made every attempt to prevent a violent incident. But the King's troops opened fire on the citizens and started a bloody battle. Oscar, in spite of Jerodel's objections, threw his support to the citizens and fought against the King's soldiers.During the course of a long battle Andre was shot and then Oscar was gravely wounded. A white flag appeared over the castle wall. With the victorious cheers of his fellow citizens ringing in his ears, Oscar quietly breathed his last. This was the first performance in which Andre was played by the top star, and his appearances were increased accordingly. 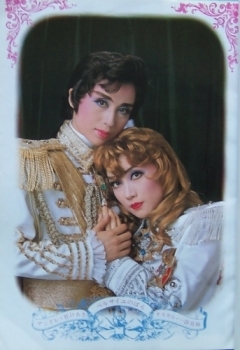 The video and Laserdisc contains Asaji Saki in the role of Fersen. Created by jenebi. Last Modification: Monday 21 of January, 2019 09:13:12 PST by caithion.